Philip Henry Sheridan (1831-1888) – A career United States Army officer and a Union general in the American Civil War, Sheridan’s career was noted for his rapid rise to major general and his close association with Lieutenant General Ulysses S. Grant, who transferred Sheridan from command of an infantry division in the Western Theater to lead the Cavalry Corps of the Army of the Potomac in the East. In 1864, he defeated Confederate forces in the Shenandoah Valley and his destruction of the economic infrastructure of the Valley, called “The Burning” by residents, was one of the first uses of scorched earth tactics in the war. In 1865, his cavalry pursued General Robert E. Lee and was instrumental in forcing the Confederate leader’s surrender at Appomattox. Later, he became involved in the Indian Wars of the West, tarnishing his reputation with some historians, who have accused him of racism. The third of six children by John and Mary Meenagh Sheridan, Philip was born in Albany, New York on March 6, 1831. Later, his family moved to Ohio. As a boy he worked in a general store and, in 1848, obtained an appointment to the United States Military Academy from one of his customers. “Little Phil,” as he was called due to his short stature of just 5 feet 4 inches, did not do well at West Point, failing in mathematics, described as having a “poor attitude,” and once, suspended for fighting. However, he graduated in 1853 and was commissioned as a brevet second lieutenant, assigned to the 1st U.S. Infantry at Fort Duncan, Texas. Over the next several years he worked at a number of posts in the West before being promoted to a first lieutenant in March, 1861, just before the Civil War. He was promoted again to Captain in May, just after the war began. During the war, he fought in a number of battles, primarily in the Western Theater and was quickly promoted to a Major General. Lieutenant General Ulysses S. Grant then transferred Sheridan to lead the Cavalry Corps of the Army of the Potomac in the Eastern Theater. 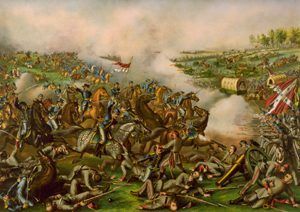 In 1864, his forces defeated the South in the Shenandoah Valley. In 1865, his cavalry pursued General Robert E. Lee and was instrumental in forcing his surrender at Appomattox. 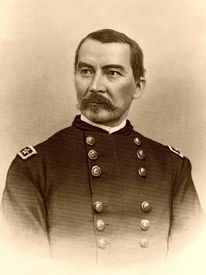 After the Civil War, Grant appointed General Sheridan commander of the Military District of the Southwest, where he was avidly involved in Reconstruction. During this period, Sheridan ruled Texas and Louisiana with an iron hand. Southerners hated him, and President Andrew Johnson called him an “absolute tyrant,” finally relieving him of command, and sending the Union’s greatest cavalry hero west to fight the Indians. He soon launched an unexpected winter campaign, which resulted in temporary peace with the Comanche, Cheyenne, and Kiowa. In 1869 he was given command of the Division of Missouri, which included the entire Plains region. He directed large-scale campaigns against the Southern Plains tribes and the Sioux. Following the tactics he had employed during the Civil War, Sheridan sought to strike directly at the material basis of the Plains Indian nations. He believed — correctly, as it turned out — that attacking the Indians’ in their encampments during the winter would give him the element of surprise and take advantage of the scarce forage available for Indian mounts. He was unconcerned about the likelihood of high casualties among non-combatants, once remarking that “If a village is attacked and women and children killed, the responsibility is not with the soldiers; but, with the people whose crimes necessitated the attack.” It was due to his action in the Indian Wars of the west, that his reputation began to suffer, at least in the eyes of historians, as he is perceived in this role as a tyrant and a racist. Both as a soldier and private citizen, he was instrumental in the development and protection of Yellowstone National Park. In 1883 Sheridan was appointed general-in-chief of the U.S. Army, and in 1888 he was promoted to the rank of General of the Army during the term of President Grover Cleveland. Major General Philip H. Sheridan died on August 5, 1888 of heart disease.